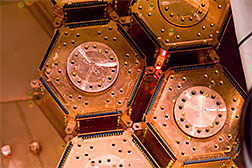 The CDMS experiment uses particle detectors made of germanium and silicon crystals. Scientists on the Cryogenic Dark Matter Search have set the strongest limits in the world for the detection of a light dark-matter particle with a mass below 6 billion electronvolts, or about six times the mass of a proton. The composition of dark matter, which accounts for more than 80 percent of all matter in the universe, could be as complicated as the makeup of ordinary matter. In the past, many experiments have focused on searching for dark-matter particles that are heavy. But recent experimental results and new theoretical models have provoked a strong interest in the search for light dark-matter particles. The CDMS collaboration, which includes scientists from DOE's Fermilab, SLAC and Pacific Northwest national laboratories, looks for dark-matter particles using particle detectors made of germanium and silicon crystals cooled close to absolute zero. If a dark-matter particle traverses a detector and knocks against the nucleus of an atom, the interaction will release a small amount of heat and electric charge, which the experiment's sensitive. The lighter the particle administering this kick, the smaller the amount of heat and charge released. That makes light dark-matter particles particularly hard to find. Pushing the boundaries of detector technology, CDMS scientists have found a way to amplify the tiny signal that such light particles would release by applying a large voltage across a crystal. This gives the scientists a much closer look at the mass range where light dark-matter particles could exist. The modified detector is not well suited for looking for heavy dark-matter particles, whose larger signals would saturate the experiment's electronics. CDMS scientists will continue their quest for both light and heavy dark-matter particles by operating their detectors in different search modes. They plan to include the high-voltage technology in a proposed, large detector to be placed more than a mile underground at the SNOLAB in Canada.